Join us for breakfast, lunch, tea, and dinner! The Cottage Café and Bakery serves up scrumptious food with a side of old-world southern charm. Breakfast, lunch, Sunday brunch, tea, *Thursday at the Bluffton Farmers Market and **Friday and Saturday dinner featuring sophisticated cuisine with a Lowcountry flair and much local fare. Fabulous fresh-baked pies, cakes, tarts, scones and cookies – and an appealing assortment of teapots, teas, coffees and homemade preserves – are also available to take out or ship. The Cottage is also perfect for private dinners and intimate parties. Dine indoors or out on the porch of this cozy, restored 1868 cottage in art-rich historic district. Full wine, beer and liquor! Reservations suggested for parties of 5+. Drink-and eat-to your health! Juices, smoothies, breakfast and lunch-for here or on the go. 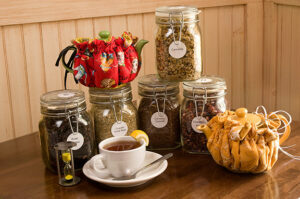 We have updated our tea list and we now offer 99+ teas! New flavor categories include: Pu-Erh Tea, Flavored Oolongs, Martini Inspired Teas, Wine Inspired Teas, Carnaby Street Fun Teas, Matcha, Chai, Mate, and MORE! *Dinner: Fri-Sat Dinner service begins at 5:30 pm. Meal service end times vary by season and may be subject to change and availability. We are happy to take reservations and always stay open for those that have booked a specific time to eat at The Cottage for dinner. We recommend reservations for 5 or more for breakfast and lunch. We recommend reservations for dinner. Reservations are a must for afternoon tea. © 2017 The Cottage. All Rights Reserved. Site by Wolfe Creative. Savor scrumptious food with a side of old-world Southern charm at The Cottage Café, Bakery and Tea Room. Dine indoors or out on the porch of this cozy, restored 1868 cottage featuring sophisticated cuisine with Lowcountry flair. The Cottage is open daily, offering breakfast, lunch, dinner, Sunday brunch and Tea — serving up coastal favorites. A The Cottage is also renowned for its wide variety of fresh-baked cakes, pies, cookies, cheesecakes and custom wedding cakes, and features an assortment of specialty teas and May River Coffee. The Cottage is ideal for cozy dining as well as small parties and events. Reservations suggested for parties larger than 5.